Astronomers studying the dramatic Chelyabinsk meteor that exploded over Russia this past February now suspect that it was a fragment of a larger celestial body — and that upwards of 20 related asteroids may be on similar trajectories towards Earth. In the half-year since the event, scientists have learned a lot about the Chelyabinsk meteor, or superbolide. We know that it was about 56-feet across (17 meters), it weighed about 10,000 tons, and was moving at 11 miles per second (40,000 mph, 64,000 km/hr) when it reached Earth. It flew in at an angle of 20° above the horizontal and unleashed the equivalent of 460 kilotons of TNT — enough energy to create a shockwave that circled the Earth twice. The ensuing explosion damaged buildings, injuring more than 1,000 people. Astronomers weren’t able to detect it because it was obscured by the Sun’s glare. One piece of information that has eluded scientists, however, has been Chelyabinsk’s precise orbit around the Sun — an important nugget of information that could tell us if other objects are on a similar path. Hoping to figure this out, Spanish researchers (and brothers) Carlos and Raul de la Fuente Marcos recently conducted an exhaustive computer simulation of billions of possible orbits to find the most likely one. The team then averaged the 10 best orbits and matched those against real asteroids in NASA’s catalogue. The asteroids, which are suspected to be part of the same family, range in size from about 16 to 660 feet across (5-200 meters). Two are relatively large, including the 200-meter wide 2011 EO40 (which was put on NASA’s naughty list last year); this asteroid, which has frequent close encounters with Venus, Mars, and the Earth-Moon system, has an orbit that's very similar to the computed pre-impact path of the Chelyabinsk superbolide. Its next scheduled flyby with earth is scheduled for September 23rd, 2025. According to the researchers, a large body looping out past Mars and then back towards Venus came apart some time within the past 20,000 to 40,000 years, likely the result of temperature extremes and planetary gravitation. 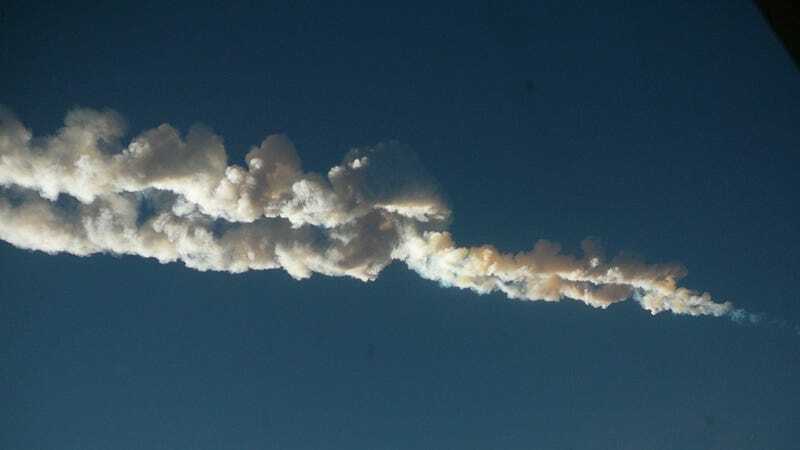 The resulting pieces now make up the “Chelyabinsk family” — a previously unidentified pack of young and related asteroids. Some of these pieces, say the researchers, could eventually follow the same path towards Earth that was taken by the meteor that exploded over Russia. But as they themselves admit, the gravitational pull of the planets could cause their orbits to drift, steering them clear of Earth. They’re also not 100% certain that they’ve nailed the exact orbits of the asteroids, including 2011 EO40. Indeed, lest we get too alarmed by this news, it’s important to note that the evidence presented by the astronomers is speculative and circumstantial. “Our calculations suggest a dynamical link between some of the candidates and the superbolide but, unfortunately, the current orbits of all the candidates are not reliable enough to claim a conclusive connection although the available evidence is certainly encouraging,” conclude the researchers. The best sibling candidate['s]...orbit was calculated from observations taken over just 34 days. That is too short a time to be able to pinpoint its position in the future, says Jon Giorgini, a senior analyst in the Solar System Dynamics Group at NASA's Jet Propulsion Laboratory in Pasadena, California. For that, researchers would need observations taken over the asteroid's two-year orbit, he says. Indeed, further analysis will be required to substantiate the astronomers' claims, including a collection of samples taken from the potential asteroidal family members (easier said than done! ), or more reasonably, by analyzing the light bouncing off the sibling asteroids to compare it with the composition of Chelyabinsk fragments. Read the entire study at the preprint website, arXiv: “The Chelyabinsk superbolide: a fragment of asteroid 2011 EO40?” It's set to be published in Monthly Notices of the Royal Astronomical Society: Letters.